Flags and boats have had a close relationship for several centuries. At sea, flags have many uses, from communication to identification, even threatening others. In fact, our concept of national flags stems from 17th century sailing ships (as explained in A brief history of flags and why we use them). However, the world of maritime flags isn’t as easy to navigate as the world of national flags. There are many types of maritime flags, each with a specific purpose and strictly enforced laws governing their use. This post won’t tell you everything you need to know if you’re planning on sailing a warship into battle, but it will give curious land-lovers a first step into the world of maritime flags. UK’s naval, government, and civilian ensigns. The ensign is the most common maritime flag. It identifies the ship’s country of origin and is traditionally flown from stern of modern ships (considered the position of honor). Sailing ships from previous centuries would often fly their ensign from their highest mast. Civilian and non-naval government vessels generally fly their ensign when entering or leaving harbor, sailing in foreign waters, or if they are signaled to do so by a warship. Naval vessels will fly their ensign while traveling, during morning or sunset ceremonies while anchored, or during battle. Lowering an ensign during battle is considered a sign of surrender. While some countries’ national flags are their naval ensign, such as the U.S. (boring), many have unique ensigns. Some even have separate ensigns for civilian, non-naval, and naval ships, such as the United Kingdom. 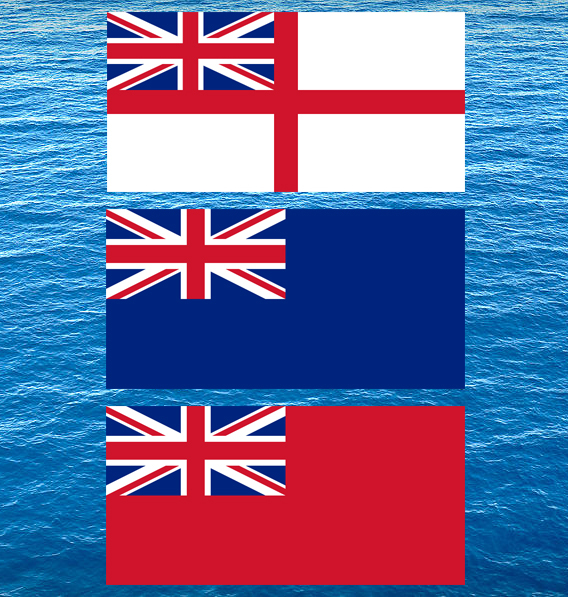 Notice how the the non-naval and civilian ensigns resemble national flags of some former British colonies. England’s white ensign is also credited as setting a design precedent for naval ensigns, as they were the first to form a well-armed navy. The naval ensigns of many European countries and former British colonies feature white as their primary color. Jacks are flown from the jackstaff (how original) on the bow (front) of the ship. They are mostly used for special occasions while ships are anchored in a harbor. Many of the first jacks used by European nations are square. As with ensigns, the English (via the United Kingdom) are trend setters with their jack design. Their jack design (which became their national flag design, often referred to as the Union Flag when used as a national flag) was copied by many nations, especially in the Baltic Sea region. A boat flying IMS flags. IMSFs are probably what you think of first when you think about maritime flags. They are the colorful, small, mostly-square flags that adorn your favorite nautical-themed bar. Their actual use is to relay messages, as each flag represents both a letter of the alphabet when used in a group and a specific message when used individually, such as “we have a diver in the water”, or “we are dragging our anchor”. NATO uses a slightly different version of signal flags based on the IMSF. Instead of explaining all of their meanings, I will direct you to this very helpful wikipedia article. Rank flags denote the rank of the commanding officer who is headquartered on that ship (known as their flagship). Rank flags are often reserved for Rear Admirals and above, but there are some exceptions. While there is no design standard for rank flags, the rank is often determined by the number of stars or dots on the flag. Courtesy ensigns are small national flags flown by a visiting ship as a sign of respect for their host country. Yacht Club flags are often small triangular flags called Burgees that have unique designs denoting membership. They can be flown while under way or anchored. And my favorite nautical flag, the Cocktails On Board flag.